Make sure you post your best Round 1 score in the Cutter & Buck Classic by 5/26 to qualify for Round 2 this month. Add to your WGT Virtual Tour year-long earnings by placing in the top 70 combined scores in your tier, and splitting the 200,000 WGT Credit total purse. Continue accumulating credits throughout the year to qualify for the Virtual Tour Championship in December, with a record one million credit purse! The first round of the Cutter & Buck Classic is underway, and competition is heating up as low scores are being posted across all tiers. Top WGT players are teeing it up on historic Royal St. George’s, site of the 2011 Open Championship for a share of the 200,000 Credit purse. With only a few days remaining to post a round 1 score by 5/26, the early lead in the Tour Legend tier belongs to BigNick092785 (USA) after carding an impressive 51. Following in close second are AllyKennedy (UK) and Lizard69 (South Africa) who both fired 52. Three-time WGT Virtual Tour champion, dansamcam (USA) sits just two shots off the lead with a 53. The Legend tier is crowded at the top, with four players tied in 1st after posting 53, including papadeaux (USA), Appetit (Albania), WaLk0fLiFe (CAN), and WeidaDeNei (USA). Early Round 1 highlights include this ace on the par-3 3rd by Legend WaLk0fLiFe (CAN) and a hole-out by Amateur taiger70 (Italy) on the par-4 17th. Round 1 of the Cutter & Buck Classic wraps up on 5/26 and will be followed by a single-play final round concluding on 5/31. Credits accumulated throughout the year-long season will determine which players qualify for the one million WGT Credit purse Virtual Tour Championship in December. There's still time to play the free Pinehurst No. 2 Back 9 Challenge on WGT, for your chance to win a $500 USGAshop.com gift card. Two players will each get a $500 gift card to USGAshop.com, one to the player with the top leaderboard score and the other to a lucky sweepstakes winner chosen at random, regardless of score. 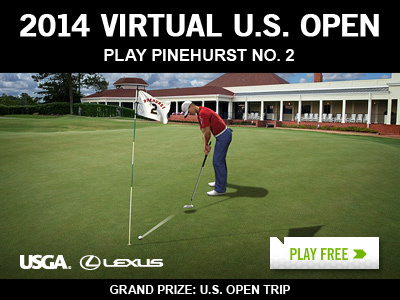 This closest-to-the-hole tournament is part of the 2014 Virtual U.S. Open on famed Pinehurst No. 2, leading up to the real U.S. Open Championships event run by the USGA in June. Famed Pinehurst No. 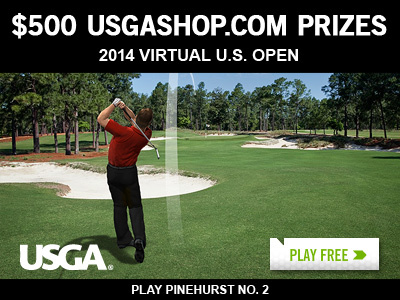 2 is being rolled out as part of the 2014 Virtual U.S. Open, with the full 18 hole stroke play Qualifier available now. The live USGA events are in June, including both the U.S. Open and the U.S. Women's Open Championships, the first time both events will be played on the same course in back-to-back weeks. Now you can play WGT Brackets against players in your same WGT tier for better chances to win. WGT Brackets are new games where you compete against other WGT players head-to-head, with 16 players starting and advancing thru 4 rounds on different courses. 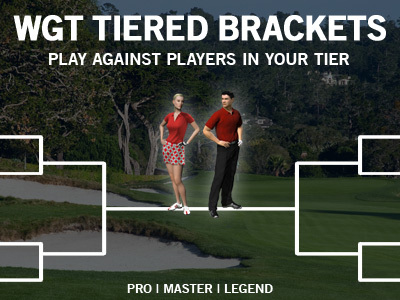 With new tiered Brackets, Tour Legends can play against Tour Legends, Legends against Legends, and so on, for more evenly matched competition. Choose to play either free Brackets or paid brackets to win WGT Credits, and new Speed Brackets with faster rounds. *Brackets are currently available on WGT on the web, not on mobile yet. 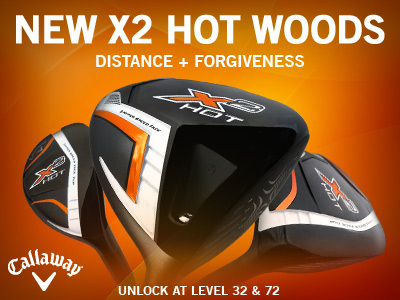 Upgrade to the new Callaway X2 Hot virtual wood set on WGT for even more distance and forgiveness. WGT players loved the first X Hot driver, so Callaway expanded the line to a full wood set. All three new X2 Hot virtual clubs and the full wood set are available now in the WGT Pro Shop. 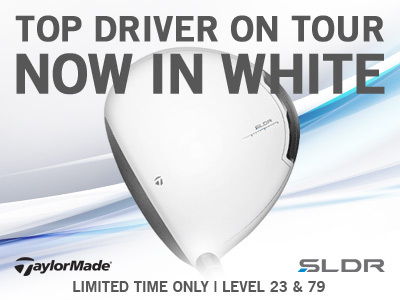 The popular TaylorMade SLDR virtual driver now in all white and unlocking earlier this summer only on WGT. The SLDR driver is the top driver on tour, and TaylorMade released an all-white version that WGT is unlocking earlier. The black SLDR unlocks at Levels 28 and 89 but the white SLDR unlocks at Levels 23 and 79, for a limited-time only. This SLDR has extra distance, trajectory and forgiveness, making it ideal for players who like to control their shots by swinging earlier or later on the WGT swing meter, without giving up as much distance. Play all 18 holes of full stroke play golf at Pinehurst No. 2 on WGT. The main event of the 2014 Virtual U.S. Open has arrived, the full 18-hole Qualifier. Drive, chip and putt on all 18 holes of the historic host course for the 2014 U.S. Open Championships. As part of the 2014 Virtual U.S. Open, players automatically receive a free USGA Avatar Male 3, but all six male and female avatars are available free in the Pro Shop during the Virtual U.S. Open for players to choose and equip. Get free WGT Credits for yourself, while you save with special offers on Mother's Day gifts for the moms in your life. You can save on flowers and gifts from ProFlowers, FTD, Shari's Berries, Harry & David, Red Envelope and more. 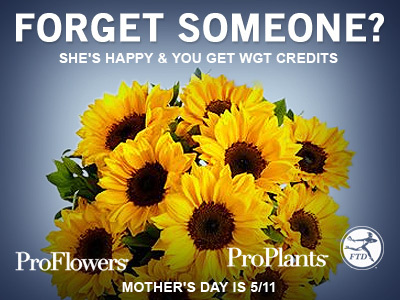 As an example, get 1,200 free WGT Credits when you buy from ProFlowers with up to 50% savings on flowers. Don't forget, Mother's Day is Sunday, May 11. Click "Earn Credits" to see all special offers. Scores have been posted and the results are in for the Glenmorangie Cup on the 2014 Virtual Tour. In the Tour Legend tier several well-known WGT players were in contention, but in the end, dansamcam (USA) thrived under the pressure of a single-play final round. dansamcam carded impressive rounds of 53 and 55 for 108 to capture his third WGT Virtual Tour victory, and regain the lead over frenchconnect (USA) in the overall season standings. dansamcam edged out poldimaier (GER) and ujjbnjk (SWE) who both posted rounds of 53 and 57 for 110. After winning three out of the four first Virtual Tour events, the big question is which other Tour Legends can keep up with dansamcam in both the monthly events and the overall season standings? Also, dansamcam now has the distinction of being the "Best WGT Player Without a Major" having only lost the GolfNow Championship Major in March to frenchconnect. But with seven events left in the 2014 Virtual Tour season, including 3 more Majors with larger credit purses, there's still plenty of golf to play. 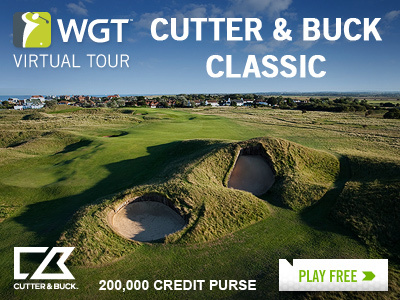 The WGT Virtual Tour continues in May with the Cutter & Buck Classic on Royal St George's. 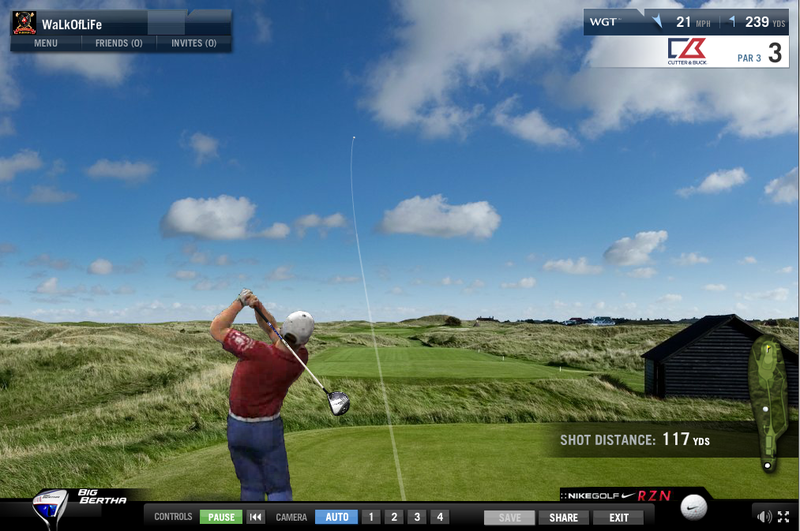 Now underway, player are competing at the site of the 2011 Open Championship for a share of the 200,000 WGT Credit purse. Credits accumulated each month count towards qualifying for the Virtual Tour Championship in December, which features a record one million WGT Credit purse. More about the Virtual Tour Championship. 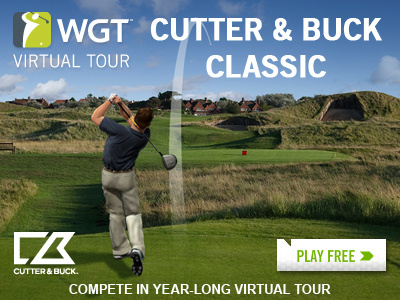 The next stop on the WGT Virtual Tour is the Cutter & Buck Classic. Compete on Royal St. George's, host of the 2011 British Open Championship, for your share of the 200,000 WGT Credit purse. Plus get a free Cutter & Buck virtual vapor ball when you enter. Post your best Round 1 score by 5/26 to qualify for Round 2. Remember to play the Virtual Tour EVERY month and accumulate credits season-long to qualify for the Virtual Tour Championship in December, with a record ONE MILLION CREDIT PURSE, split among just the Top 64 season qualifiers in each of the Pro thru Tour Legend tiers. Plus, Golf Channel is covering the WGT Virtual Tour all year, including online scores, virtual leaderboards, updates and even interviews with WGT players, just like the professional tours! See Golf Channel Coverage.